You can find our latest newsletter here with information on the Everest base camp trek and our new Patron. We are delighted to welcome Lord Dubs (Alf Dubs) as a patron of the Trust. Our Annual Report for 2017 - 2018 is available to view here. Thank you to our patrons Sue MacGregor CBE and Lord Peter Hain for an outanding and inspiring evening. Sue MacGregor conducted the interview with great professionalism, while Lord Hain gave a fascinating account of Mandela’s life, including his personal meetings with the Madiba and views on South Africa today, based on his recently published book, ‘Mandela: His Essential Life’. We are delighted that around £2,750 was raised for the Trust. 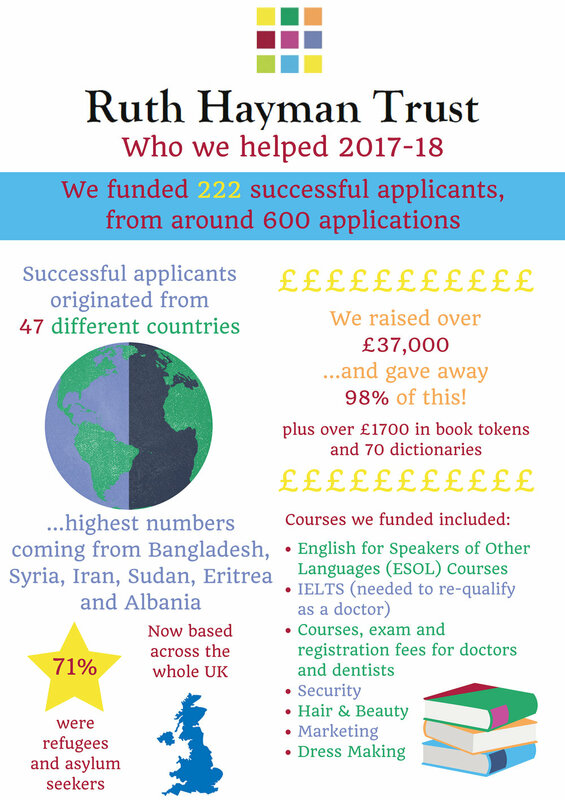 We'll be producing our full annual report later in the year, but find below the key points, including how many people we supported, where they were from and what courses they asked us to support. Here's our latest Newsletter with all the recent updates from the Trust. Thank you to all those who supported the Quiz night and thanks to Working Men's College for hosting the event. Over £350 was raised for the Trust. Mary Simpson, Ruth Hayman Trust Chair, interviews former Chair, Sheila Rosenberg. Read the full interview. Key points for Annual Report 2016 - 17. Click here. Thank you Hanna and your supporters for raising £800 for the Trust. Click here for our Annual Report 2015 - 16. Thank you supporters, volunteers, student fundraisers, patrons, beneficiaries and former trustees who helped to make this event such a memorable occasion. Over £5,000 was raised for the Trust. Many thanks to our generous sponsors: the English Speaking Board, Wordbright Ltd, and an anonymous donor. As a result, all funds raised will go directly to our beneficiaries. Read more in our December 2016 Newsletter. Karen Robertson from Derby College with two of the winning fundraisers, Vafa Aliyera and Esmael Salout. The English and Maths students from the St James Centre raised £437.55 for the Trust and became the winners of the £200 prize donated by ESB (the English Speaking Board). The students promptly voted to donate their prize to CLIC Sargent, a local charity that supports young cancer sufferers and their families. The learners raised the money by selling homemade food, dresses and other items. Karen noted "the fundraising event has greatly helped improve their skills and confidence".